Sea Sessions is a surf and music festival in Donegal. 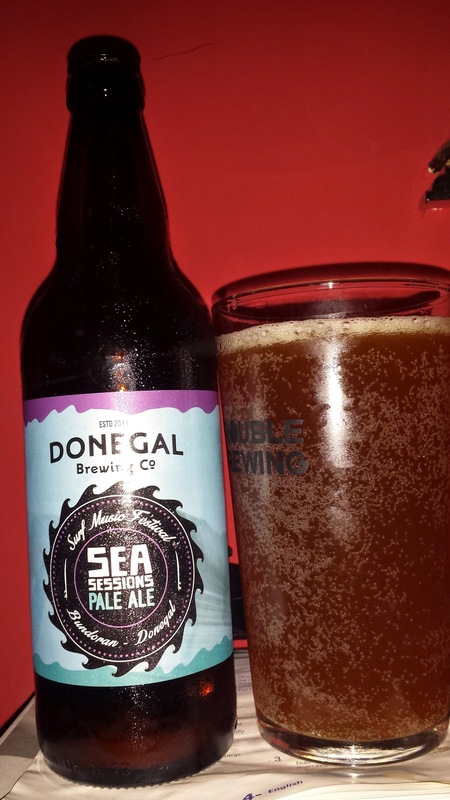 To commemorate it, the Donegal brewing company released a pale ale of the same name. As you might expect, the beer is designed to be sessionable. At 4.5% it just about achieves this. I might have liked to have seen it more around the 3,8% mark but that might have detracted from the body significantly. On the nose, it's clear that this is a malt forward beer. In fact, I didn't perceive any obvious hop aroma but perhaps I had it a little too cold. It tasted like a cross between an English pale ale and a Vienna lager with a lingering bitter finish. It's not exciting, just a very well made beer that I could easily stick with all night. 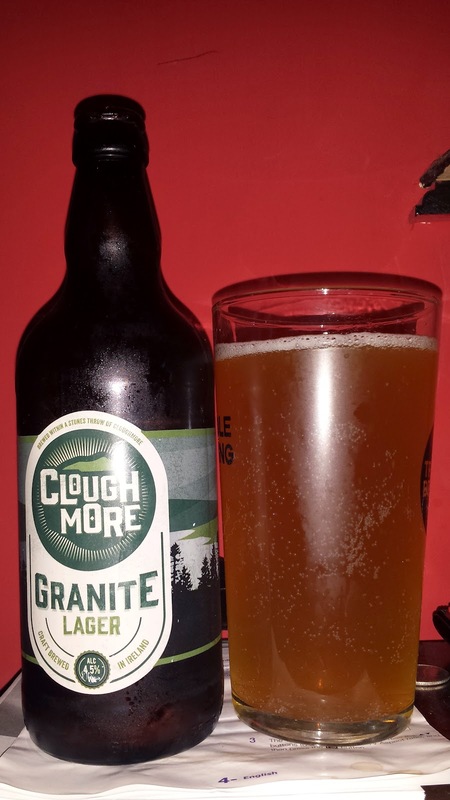 One of the newer Irish brands is Clough More which is contract brewed at the Whitewater brewery for Noreast, one of Ireland's beer distributors. They have a few beers such as Granite Lager pictured above as well as a Heather IPA and Dark Water stout. Coming from Whitewater, these are very well made beers as you might expect. I didn't bother taking any tasting notes, I simply enjoyed the beers. As you can see from the picture, the lager is unfiltered and quite murky. In fact, it looks a little like a first homebrew attempt but it does taste rather pleasant. I thought the stout was the strongest of the lineup. A pretty robust flavour from a stout with a very light body. The heather IPA was interesting in that it wasn't too different to the lager. It was bigger but it looked and tasted quite similar. I'm not 100% sure what the heather was doing for it. I'll probably have to revisit it at some point as to be honest, I only had a mouthful and let my wife drink it. The most interesting thing about the Clough More beers is that a distributor/importer is having them produced. I imagine it's an easy way to increase their portfolio to include more Irish beers rather than relying on imports. In fact, I wonder is imported beer starting to see a slight decline now that Irish beer has become so easy to get around the larger population centres and even in many rural areas?